In collaboration with Åbäke & Markus Miessen with Westmead Care Home – Barby Asante with Inspire, Southwark – Marcus Coates with St. John’s Hospice Beatrice Gibson with Camden Homes For Older People – Tom Hunter with Age Concern, Hackney. There are currently 9.7 million people aged 65 and over in the UK and, by 2020, there will be 12.5 million, or one in five people, aged 65 and over (Government Actuary’s Department, 2005). Of those aged 60 and over, 2.3 million older people live in homes that do not meet minimum housing standards and many face intense forms of segregation and isolation. While it is common to suggest that art may be ‘good’ for those facing isolation and poverty, Skills Exchange recognizes that among an aging population there are also many key skills and experiences from which other social sectors can learn. This is extremely important at a moment when younger generations are uncertain about their future. Skills Exchange attempts to produce opportunities for exchange between artists, elderly people and younger people in the name of broader social change. It suggests that the isolation of older people, who are increasingly segregated by processes of privatization and development, is unhealthy for all social groups. Such processes often focus on artists and younger people as part of a futuristic ‘creative’ urban class, while older members of the community are not considered. Skills Exchange brings together artists, elderly people and young people to ask what are the possibilities? What forms of participation, articulation and resistance can be derived from such collaborations? These questions also apply to the institutions that provide elderly care, such as hospices, social programmes and care homes. With the closure of day centres and activity programmes and the tendering of private contracts, care workers increasingly describe the difficulty in their attempts to produce nurturing environments and create more equitable dynamics between the carer and the cared for. Under intense budgetary constraints, old patterns set in. Artistic processes can interrupt the everyday procedures, asking workers, carers and artists to orient themselves differently. Conversely, as the cultural sphere becomes more market driven, care workers and those living in care question the participating artists, pushing them beyond their own patterns of production. Such questions have challenged elitism, the ethics of care and participation, and practices of collective accountability in the aesthetic process. 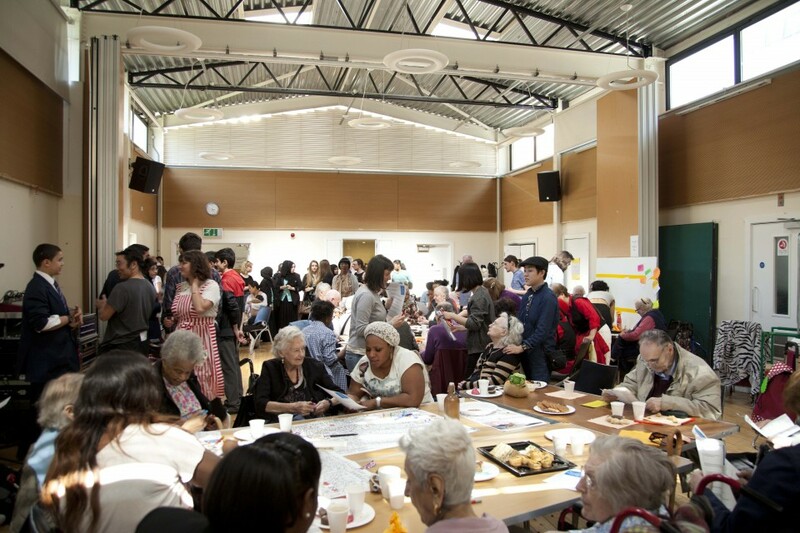 With a view to encouraging intergenerational collaboration and dialogue, and the development of creative activities that are both stimulating and challenging, Skills Exchange will bring together age and experience with youth and ambition by fostering relationships between older people and artists, writers, designers and architects. The expertise developed over a lifetime is often overlooked, as people get older, particularly once they are over seventy. Past this age, people cease to be defined by their passion or individuality: often the work they have undertaken and the skills they have developed throughout their lives become invisible – their expertise is marginalised and they are defined simply as being old. For the first time in history, the number of people aged over 65 in the UK exceeds those under 16. If we do not place more resources into ageing research now, we will be unable to cope with the implications of age-related disease, dependence and frailty in 20 years time. It is estimated that by 2037, demographic changes mean that the number of carers could rise to 9.1 million. Today’s seniors were schooled before the rapid expansion of higher education. This means that their levels of formal education are much lower than that in younger members of society. Many have the lowest level of secondary education or none at all. The situation of the elderly must be rethought by taking into account their contributions to society. Strategies must be found to make it possible for them to participate in community life, while improving the spatial realities of the elderly. The situation of the elderly in relation to the digital divide depends highly on the environment, infrastructure and opportunities provided, as most elderly people are unfamiliar with IT and need encouragement and guidance. National social and urban policies are closely interrelated. The objectives of these services are to protect the needy and the helpless, to equalise opportunities, and to establish a minimum material standard of living. Urban policy concerns disproportionate urbanisation and the size of metropolitan areas, the resulting drain of population from rural areas, and the government’s attempt to influence the spatial distribution of population between cities and rural areas. If social and urban policies are to complement each other, government should assume more responsibility. How can one think of models for institutions and think tanks that allow for a critical and optimistic engagement with social, political and spatial realities? Our research and spatial strategising role at the Serpentine Gallery will attempt to understand and instrumentalise several layers of critical participation within the proposed field; based on a thorough investigation of spatial conditions as a means of a cultural investigation alongside teams of experts and institutions. Academic involvement will be fostered through a series of collaborations with other centres of knowledge production across Europe. As an underlying thesis, the research will further enquire the role of the artist and architect in relation to contemporary institutions and the institutions’ role of participating in the socio-political environment. The research will present and discuss today’s need for actors operating from outside existing networks, leaving behind circles of conventional expertise. An alternative model of participation within spatial practice will be rendered, one that takes as a starting point an understanding of participation beyond models of consensus. Instead of aiming for synchronisation, such model could be based on participation through the conscious implementation of zones of conflict. If humans live together, spatial conflicts arise: a collision of opposite interests in using space. Spatial conflicts also cause conflicts between organisations, groups and persons. To immerse in the spatial realities of these individuals and groups can facilitate and understanding of the effects of what one might call design-components, be they spatial, temporal, social or economic in nature. Existing realities will be challenged through conversation, debate, critical observation, careful documentation, selective and purposeful participation and interaction and inventive framework-proposals. How can one facilitate a design process that is not situated in pre-established modes of practice? What could a polyphonic practice potentially be? Is it possible to curate issues of spatial and political relevance producing an effect that is measurable? How does one produce alternative types of knowledge that can be packaged and re-appropriated/ re-applied?